Troy Bayliss has won the first race at Misano, extending his lead in the World Superbike championship over nearest rival Colin Edwards. Edwards, who led for much of the opening ten laps, had no answer after Bayliss passed him, and the Honda ride had to settle for second, with Britain’s Neil Hodgson third. Haga was fourth, Bostrom fifth, and Chili sixth, with possible front-runner Ruben Xaus crashing out on lap three. Chris Walker eventually claimed seventh, after a race long assault on James Toseland finally resulted in an error on the last lap. Toseland finished in eighth, Pedercini ninth, and Lavilla tenth. Race two gave British fans something to get excited about, as Neil Hodgson made a great start to take the lead, underlining the reasons for his factory Ducati ride next year. 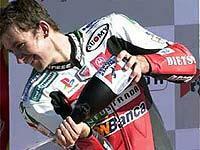 He managed to hold off Colin Edwards in the early stages, before succumbing to the Texan. Troy Bayliss also got past, and it became a two-man race for the lead, as it was in the first race. The two front runners were both on Michelin tyres, and they managed to pull away from the Dunlop shod bikes of Hodgson and Haga. Bayliss eventually made a break from Edwards who found himself unable to match the Australian. Hodgson fell into the clutches of Noriyuki Haga, and settled for fourth. Ben Bostrom had a lowly ride to fifth, with Gregorio lavilla pipping Pierfrancesco Chili to the flag for sixth and seventh, with Chris Walker eight. James Toseland was unable to get revenge for losing seventh to Walker in the first race. He received a stop and go penalty, and was eventually black-flagged and disqualified from the race for not entering the pits. His weekend was still more rewarding, and less painful than Ruben Xaus’s, however, as the Spaniard took another trip into the Misano gravel traps in race two.